The image above of the central region of Centaurus A reveals the parallelogram-shaped remains of a smaller galaxy that was devoured about 200 to 700 million years ago. The giant galaxy, Centaurus A (NGC 5128) is the nearest giant elliptical galaxy to Earth, at a distance of about 11 million light-years. 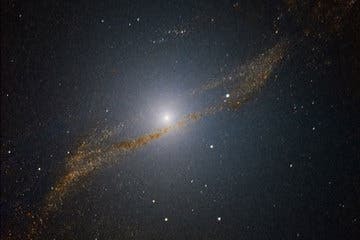 The galaxy hosts a supermassive black hole that is 200 million times the mass of the sun, or 50 times the mass of the black hole at the center of the Milky Way. This strangely beautiful and spectacular appearance is due to an opaque dust lane that covers the central part of the galaxy. This dust is thought to be the remains of a cosmic merger between a giant elliptical galaxy and a smaller spiral galaxy full of dust that was swallowed up 200 to 700 years ago. The central region of the image reveals the parallelogram-shaped ghostly remains of the smaller galaxy, the contents of which appear to be churning inside Centaurus A's core, triggering new generations of stars. First glimpses of the "leftovers" of this event were obtained thanks to observations with the ESA Infrared Space Observatory , which revealed a 16 500 light-year-wide structure, very similar to that of a small barred galaxy. More recently, NASA's Spitzer Space Telescope resolved this structure into the parallelogram, which can be explained as the remnant of a gas-rich spiral galaxy falling into an elliptical galaxy and becoming twisted and warped in the process. Galaxy merging is the most common mechanism to explain the formation of such giant elliptical galaxies. The new images, obtained with the 3.58-metre New Technology Telescope at ESO's La Silla Observatory, allow astronomers to get an even sharper view of the structure of this galaxy, completely free of obscuring dust. The original images, obtained by observing in the near-infrared through three different filters (J, H, K) were combined using a new technique that removes the dark, screening effect of the dust, providing a clear view of the centre of this galaxy. "There is a clear ring of stars and clusters hidden behind the dust lanes, and our images provide an unprecedentedly detailed view toward it," says Jouni Kainulainen, lead author of the paper reporting these results. "Further analysis of this structure will provide important clues on how the merging process occurred and what has been the role of star formation during it." "These are the first steps in the development of a new technique that has the potential to trace giant clouds of gas in other galaxies at high resolution and in a cost-effective way," explains co-author João Alves. "Knowing how these giant clouds form and evolve is to understand how stars form in galaxies." Previous observations done with ISAAC on the VLT (ESO 04/01) have revealed that a supermassive black hole lurks inside Centaurus A. Its mass is about 200 million times the mass of our Sun, or 50 times more massive than the one that lies at the centre of our Milky Way. In contrast to our own galaxy, the supermassive black hole in Centaurus A is continuously fed by material falling onto into it, making the giant galaxy a very active one. Centaurus A is in fact one of the brightest radio sources in the sky (hence the "A" in its name). Jets of high energy particles from the center are also observed in radio and X-ray images. The image above is based on data collected with the SOFI instrument on ESO’s New Technology Telescope at La Silla.